There’s something uniquely Canadian about a company celebrating its runner-up status, but the achievement announced today by Vancouver’s BroadbandTV (BBTV) is undeniably impressive: its February viewership numbers fell behind only Google and Facebook, making it the third most-watched content creator online. 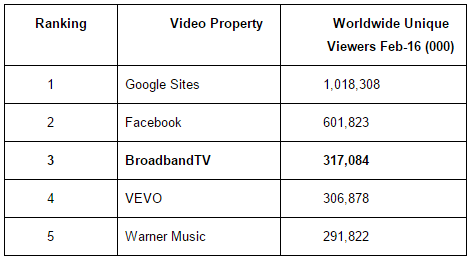 And unlike the viewership numbers considered by (Google-owned) YouTube, BBTV’s content even attracted more viewers than Warner Music Group and Vevo, the hosting service co-owned by Universal Music Group and Sony Music Entertainment that’s behind seemingly every viral pop music video. In fact, 31 per cent – almost a third – of viewers who watched video content across Google’s sites, including YouTube, watched content from BBTV in February, the company said. BBTV’s leaders may be making some noise about their achievement, but are also making clear they don’t plan to coast on it. In a statement founder and CEO Shahrzad Rafati said she expects the company’s growth to only intensify this year as it acquires new content creators, settles into its new headquarters and, of course, continues creating new videos of its own. During the past year BBTV has acquired childrens’ content producer YoBoHo and launched a new network for its content, HooplaKidz, last September; collaborated with the Huffington Post to establish citizen journalism channel Outspeak; and recently launched Windfall, a partnership with record label Bertelsmann Music Group (BMG) focused on discovering new musical talent. The company’s other content creators include gaming network TGN, hip-hop music network Opposition, electronic dance music (EDM) network WIMSIC, and sketch comedy troupe Unsolicited Project. It also offers video content management services for enterprises.